What’s going on with the second largest subway system in the United States is stunning and dangerous. It isn’t really working anymore and the mood of the average Metro subway rider in Washington, D.C. is getting increasingly dark and angry. It is palpable and widespread and worse than it has ever been. So, of course, Metro is considering holding public hearings on possible fare increases and service cutbacks next week. We subway riders do occasionally talk to one another and a common concern these days is that you never know what you will confront on an average weekday morning or evening commute. There’s no confidence of arriving to work on time. There’s no sure thing about when you get home. Increasingly, there is concern you may not get to work or home at all. Paying more for the honor and the risk seems rather outrageous. Surely, when 61 year-old federal contractor, Carol Glover, woke up Monday morning, January 12th in her Alexandria, Virginia home, she had no reason to suspect it would be her final day. Twenty four hours later the cause of her death would be established; acute respiratory failure due to smoke exposure after being stranded on a Metro train outside the L’Enfant Plaza Metro station later that afternoon. More than 80 others would end up hospitalized that day, some 200 evaluated by medics. A friend of mine from work was on that train. He self-evacuated. He was following the lead of two military guys on his subway car who were initially patient as they waited for instructions. But as 15, 20, 30 minutes went by and the situation just got worse and worse and smoke was now getting into the subway cars- they had all had enough. They managed to open one of the sets of doors, identified where the electrified 3rd rail was to stay far clear of it and walked a few hundred feet to the station platform. They were actually surprised at how close they were to the station and shuddered to think of the dozens and dozens of their fellow riders who continued to wait for help while Metro officials managed to turn the event from an “incident” into a near catastrophe. On Tuesday, February 10th, the National Transportation Safety Board sent letters to Metro officials explaining what they saw as the cause of the problem that day along with an urgent plea to have Metro correct a major flaw: it has no way of knowing where smoke might be in their tunnels. And because they didn’t know that an electrical arc had caused the smoke or where- Metro officials miles from the L’Enfant Plaza station took steps that only made matters worse- much, much worse. Metro botched the operation of ventilation fans in and near the L’Enfant Plaza station during a fatal smoke emergency last month, causing a mass of noxious fumes to move hundreds of feet toward a train in a tunnel and then linger around it while scores of riders gasped for air, federal investigators said Wednesday. In its most detailed revelations yet about the Jan. 12 incident, the National Transportation Safety Board outlined a sequence of missteps in which Metro controllers, 11 miles from the scene, activated two sets of giant fans at cross-purposes with devastating consequences. The two sets of fans, on opposite ends of the train, were both pulling the smoke instead of one set pushing while the other pulled, the NTSB said. As a result, the mass of fumes settled over the stationary train and stayed there. And there’s more. While his bosses back at Metro headquarters were accidently ensuring the smoke in the tunnel would go toward and eventually envelope the train, the subway operator forgot to shut off the ventilation system in the cars so all the smoke outside the trains went inside the cars. You could have actively tried to injure people and not had as much success as Metro bosses and the train operator had that day trying to help. Just this past weekend, there were at least three other “smoking” incidents in the Metro subway system- two at the Foggy Bottom station near George Washington University and one at the Woodley Park station near the National Zoo. The explanations range from smoke caused by the train’s brake systems to smoke caused by a “maintenance” problem. But noxious smoke is not the extent of the trials and tribulations for Metro’s beleaguered riders. There is rarely a day that there is not a major delay or its cousin, the infamous “residual delay,” that Metro apologizes for constantly. I cannot even count the number of times such delays have caused dangerously crowded platforms. This is usually when train operators are at their surliest. A funny thing happens when trains stop running for, say, 30 to 45 minutes…they get crowded. Cue the internal intercom system that only works sporadically. “Passengers, I REPEAT, stop leaning on the doors. We will be going nowhere if you are leaning on the doors. I will NOT hesitate to offload this train.” The trains are late, the platforms and the subway cars get crowded and the operators yell at the passengers. Nice. One of my favorite incidents that I personally witnessed was the time a mechanical malfunction had occurred on the yellow line and the trains had to single-track through the Pentagon City station. At one point, the station manager ordered the 1,500 or so people I estimate were stacked up on the platform, to go up the escalators and go to the other side of the tracks- that a train headed to D.C. would be operating on what was ordinarily the track headed away from the city. Metro is asking for more money from each of the jurisdictions in the Washington area. It is asking Congress to restore the full tax benefit for subway commuting that was drastically cut back last year and resulted in ridership losses. Failing at these efforts, Metro will consider upping fares and cutting back on service again. I don’t think these Metro folks understand the fury that is out there. Too many people regularly arrive to work late or have been stuck on a train or a platform when they just wanted to get home to their families. Too many people have to put up daily with broken escalators, elevators, and turnstiles. But more importantly, too many people have been killed or injured. Here’s a list: That’s 11 dead and 94 injured in Metro collisions that occurred in 1982, 1996, 2004, and three in 2009. Derailments have killed 3 and injured over 40. In fact, during a 20-month period starting in January of 2003, there were a total of 8 Metro derailments. This is all in addition to January 12th of this year. I don’t think this is just a money issue. All the money from all the jurisdictions in the DC metro area will not fix what appear to be incompetent management and a culture in which the users meant to be served by this subway system are actually treated like annoyances and unwelcome cargo. Metro seems to be simply overwhelmed. And what remains unsaid but is surely on the minds of Metro’s hundreds of thousands of commuters and their families- is what happens on that awful day when someone or some group purposely tries to inflict harm on the residents of the nation’s capital by attacking its subway system. 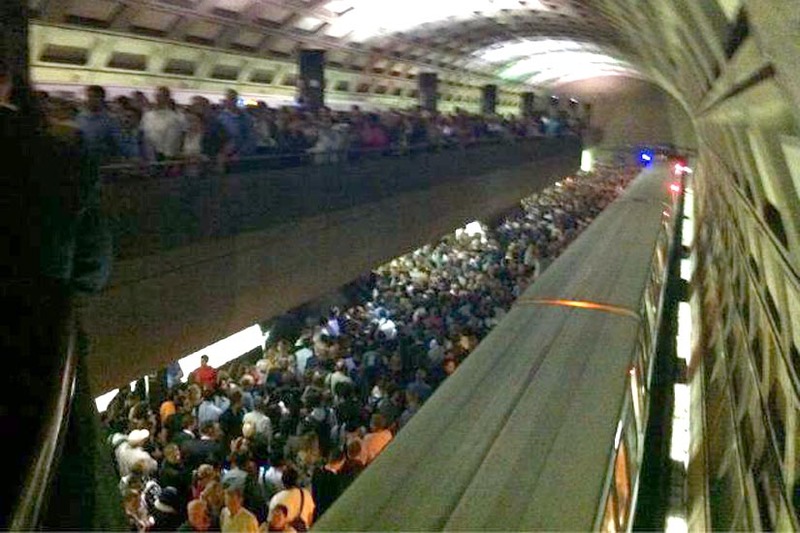 Will there be anyone at Metro who will have a clue about what to do to save our lives? I suspect we will be totally and completely on our own. Categories: Culture, Transportation Tags: Metro, Metro Management, Metro Subway System, Subway Danger, Subway Delays, Subway Money, Subway Safety, Washington D.C.